Emerenciano Rodrigues da Silva was born in 1946 in Ovar. He now lives in Porto, where he studied and got his BA at the College of Fine Arts Soares dos Reis. After 1973 he saw his paintings as an initial attempt to write, without having to cross the borders between pictures and words. He examined the symbolic dimension of the writing, but expressed himself through written reflections and poems as well. 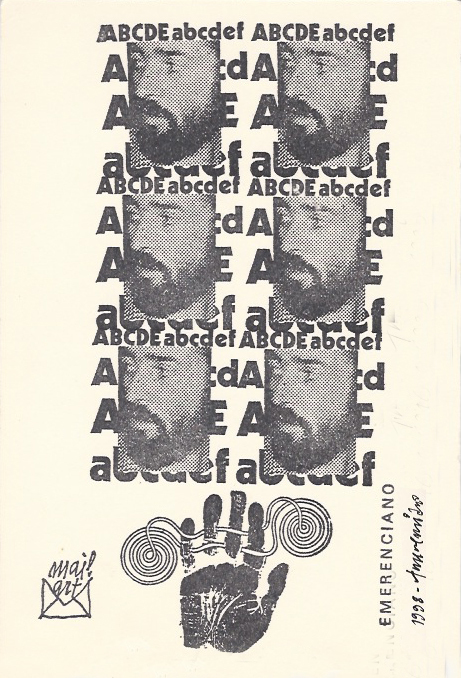 In 1980 he was invited to participate in a Mail Art exhibition, and has since then not stopped it. He still engages himself in visual and experimental poetry. In 1986 he received a scholarship from the Gulbenkian Foundation that allowed him to do a study trip to Paris. Emerenciano da Silva Rodrigues wurde 1946 in Ovar geboren. Er lebt heute in Porto, wo er bereits an der Hochschule der Schönen Künste Soares dos Reis studierte und seinen BA ablegte. Nach 1973 sah er in seiner Malerei einen initialen Versuch zu schreiben, ohne dabei die Grenze zwischen Bildern und Worten durchkreuzen zu wollen. Er untersuchte die symbolische Dimension der Schrift, drückte sich aber auch durch schriftliche Reflexionen und Gedichte aus. Im Jahr 1980 wurde er eingeladen, sich an einer Ausstellung der Mail Art zu beteiligen, und seitdem hat er nicht damit aufgehört. Er beschäftigt sich immer noch mit visueller und experimenteller Poesie. Im Jahre 1986 erhielt ein Stipendium der Gulbenkian-Stiftung, das ihm eine Studienreise nach Paris ermöglichte. 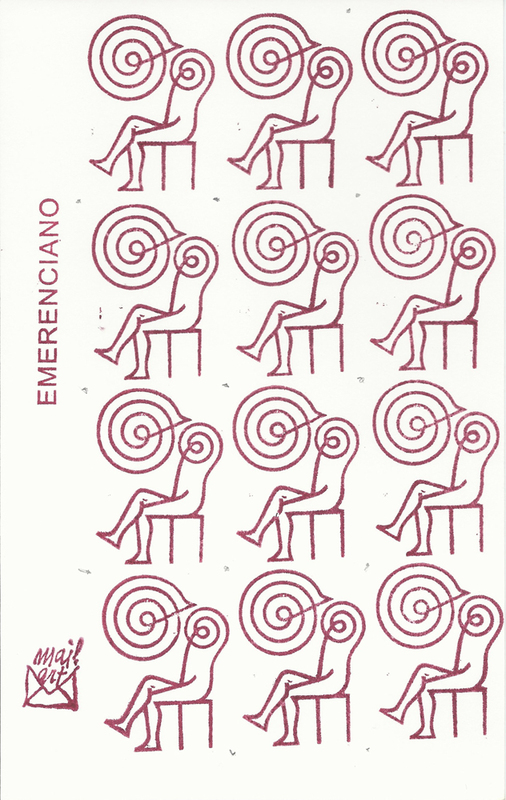 1983 – ESCRIPINTURAS about ten years of activity collecting texts of exhibitions and Press catalogues, autor edition, Porto. 1986 – ESCRIPINTURAS AINDA collecting texts of catalogues and Press, Pepolim Fundation edition, var. 1989 – EMERENCIANO OU O TEOR DAS ACTAS, text of Mário Cláudio, edition of Imprensa Nacional Casa da Moeda, Lisboa. 1994 – A AVENTURA DO SIGNO, 20 years of activity, with Maria João Fernandes, António Ramos Rosa, Eugénio de Andrade, E.M. de Melo e Castro, Mário Cláudio, Gilbert Lascault, Adélio Melo texts, Cooperativa Árvore edition, Porto. 2005 – O ENREDO DA ETERNIDADE, Adélio Melo text, Afrontamento editions, Porto. 1992 – ESCUTAR AS MÃOS, drawings album with a Eugénio de Andrade poem, author edition, Porto. 1993 – A RUA CHÃO DA ESCADA, poetry with drawings, Pedro Barbosa text, author edition, Porto. 1998 – A MÃO TINGIDA SOBRE O ESPELHO e CHÃO PRISÃO DO MUNDO, poetry with drawings and a text of Arnaldo Saraiva, Campo das Letras edition, Porto. 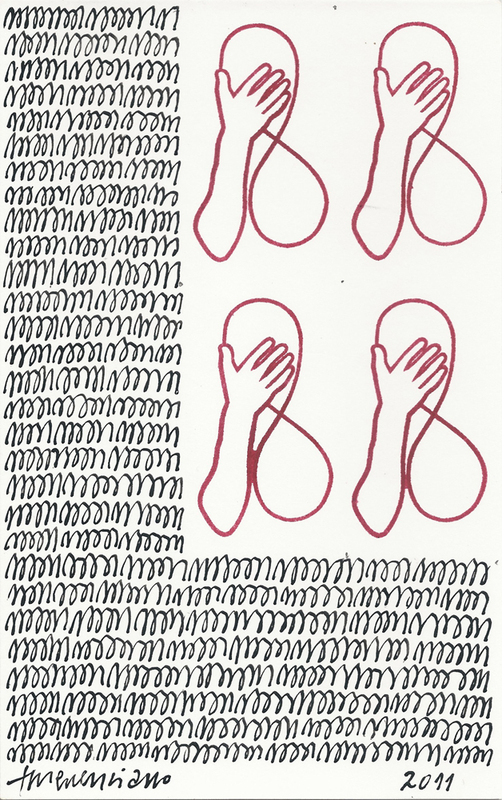 2001 – IDADE DAS IDADES, drawings album with my text, Caixotim editions, Porto. 2005 – ASSIMETRIA DO SER, poetry with drawings and a text of Mário Cláudio, Afrontamento editions, Porto. 2006 – IMPURA ATITUDE, drawings album with my text, Afrontamento editions, Porto. 2010 – IR&VIR, words and images, Afrontamento editions, Porto.